Jen at A Thrifty Mum is calling for posts for December’s Thrifty Families Blog Carnival, which is here aton December 8th.All you need to do is send in a post (on making or saving money, thriftiness, upcyling. recycling or living frugally) you have written in the past month (it can already have been published on your blog.) mail@jenwalshaw.co.uk with Thrifty Blog Carnival in the subject header by 6pm on December 6. 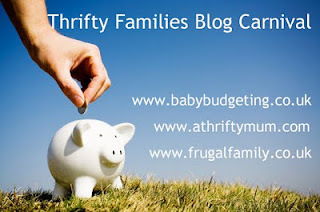 Each month across many blogs the subject of making money, saving money, living frugally and being thrifty are shared. It’s a sign of the times and a more careful and caring generation of people that we protect our resources, recycle, upcycle and make do. The last one held here at baby budgeting had over twenty fabulously thrifty posts and was amazing. Do join in! Previous Post Win £100 John Lewis Voucher in time for Christmas!